The yellow photo challenge is a challenge where you take photos of yellow things. 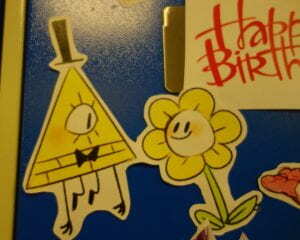 The 1st photo is of the illuminati on someone’s locker. 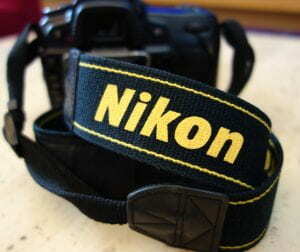 The 2nd photo is of my friend Rebecca’s camera. 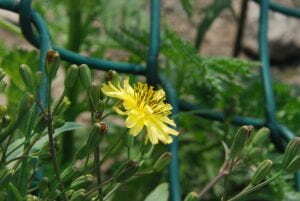 the 3rd photo is of a yellow flower near the dome. The flint heart-is a very fun book and agin I wouldn’t recommend it to younger kids because in the first part if the book there is some death. The main character is Charles Jago who out a a lot of kids he thinks that he has the most brains the whole family. the flint heart if a piece of flint shaped like a heart made by Fum a man from the stone age. the flint heart has a magic power that can make the holder of the charm have a very mean/hard heart. Fun made the charm for Phutt who wanted to be leader of the tribe. years later after photo dies Fum puts the flint heart into a pile of stones. Fast forward into England thousands 0f years later where a dad finds it. Finally Charles goes to the fairies for help. While the flint heart continues to work it’s magic on different people, the fairies keep calling Charles back to their holt because he can always come up with answers. A Jacky Toad called the Marsh Galloper has the flint heart taken from him and to skip execution he must pass a test. Will the Galloper be saved? Will the flint heart be destroyed once and for all? Will Charles find his way out of this mess? You’ll just have to see . 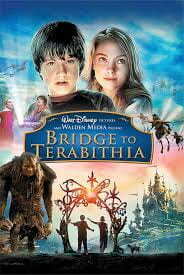 The Bridge to Terabithia– is my favorite book that Kathrine Paterson has written. It was a fun book but had some sadness. The age range for this book would probably be 9-12 because it was complicated. The main character is Jess Arons who wants to be the fastest runner in all the 5th grade. He is a really good drawer. On the first day of school jess is racing with the other boys when instead of coming in first he comes in 2nd because a girl named Leslie beat him. Then one day Jess and Leslie swing across a river with a rope a enter a magical place called Terabithia. Jess and Leslie and the rulers so when Christmas comes jess wants to get her a present but jess doesn’t know what. So Jess gets her a puppy. Leslie names him Prince Terrin, PT for short, he is now the prince of Terabithia. Then one day jess and his music teacher miss Edmunds go to an art museum alone but when jess gets back his whole family thought he was dead. Jess knows something is up. But what? 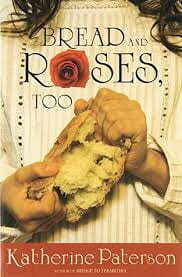 Bread and Roses Too– This book was very powerful and really got the point across. I don’t recommend this for younger kids because there was some killing and swear words. The main character was Rosa Strutti who’s father had died in a fire at a mill he worked at. Rosa’s sister Anna lied about her age so she could quit school and start working but their family still barely had enough money to feed them. Rosa’s mom and Anna started to march in the strike where all of the people who aren’t being paid enough stopped working and started protesting. Everyone was feeling every accomplished until a Syrian boy was stabbed to death, Annie Lipizzo was shot, and people were sent to a life time in jail. Rosa thought everything was already pretty bad until here mom sent her to Vermont to live with another family until the strike was over. Now she’s covering up for an american boy who is a stowaway in their train. Will Rosa’s mom and Anna be killed? Will the boy be discovered? Will all of her years in school finally pay off? Are the Garbatti’s ( the family they are staying with) hiding some secret? I guess you’ll have to read the book. For spring break I went to Japan! First I went to Tokyo and we stayed in a tiny apartment with all four of us. every day we took the train to get to different places like the busiest intersection in the world (shibuya) where 8 different streets that all collided. Also I ate fish eggs. But the strangest thing I did by far was go on the noodle quest where we had to try as many of the three main noodle types Udon,Soba,and Ramen. We succeeded and the best type of noodle are Udon because they are so thick and the broth they came in tasted really good. On our last day in Japan we went to Disney Sea. But we only when’t on two rides because my sister insisted on going in this ride that had a wait time of 2 and a half hours, it was called the raging spirits and it was the first ride I went on that had a 360 loop:) the weirdest ride I went on was 20,000 leagues under the sea where your in a submarine and there are sea creatures floating around you. Then for the last leg of the trip we went to a place called Nagano, Karuizawa which is a small mountain town. while my dad fished, me, my mom, and my sister went to an Onsen which is basically a really hot hot tub. On our last day in Japan we got a call from our dad saying that his guide he was fishing with had gone crazy and threw my dad’s fishing bag out of the car and told us that he would meet us at a temple called the Zencoji Temple. The best thing we did there was the tunnel of enlightenment where it’s pitch black and you are supposed to keep your right hand on the wall and find the key to enlightenment and you will ring you way out of the tunnel. But the coolest thing was when I saw the emperor of Japan walking though the Tokyo train station! There where secret service people everywhere. Overall I had a really fun spring break. Some african american kids living Britain haven’t gone out in nature in a year or more. Study’s show that rich and white people go out in nature more than african americans and poorer people. Findlay Wilde is 13 and writes about wildlife. He says schools stop teaching students about nature as they get older. Also parents stop taking older kids out into the wild. Findlay says that if nature groups came into schools they might inspire teachers and students to go out into nature more. Nature groups also say that there aren’t enough minorities in their groups. On Friday and Saturday the coolest sleepover happened at Taylor’s house. The best part is when we all started to watch Alvin and the Chipmunks, the Road Chip. Most of us got there at 5:50 and when we all got there(all 17 of us) we went to the park and played grounders. Finally we all got into the two vans and all went out for Kro’s Nest. Sibil even came, but she put a band-aid over her stitches. Once we got back to Taylor’s house we ate ice cream cake and started Alvin and the Chipmunks, the Road Chip. But about 10 min. into the movie we all ate mud with is just crushed Oreos, chocolate, and gummy worms:). Then we started the movie back up agin until mom came to pick me and another girl up to go home. America is in lazy mode and some people like me are shocked at what young adults call inconvenient these days. Nearly 40% of the millennials in 2015 said that cereal was too much work because they had to wash a bowl after eating it. The cereal industry isn’t doing so well. Sales have dropped 30% in 15 years. Did you know that about 15% of a restaurant’s meals are delivery? Roughly two-thirds of all american families have two working parents instead of one. Personally I think that all of this inconvenient stuff that young adults are saying is wrong but I think they are saying that because they have to get to work and don’t have time to do the dishes. I didn’t know that more parents are working than staying at home. Actually I thought the opposite, more parents where staying at home. This makes me upset to here that America is on lazy mode because I had it in the back of my mind but never though it was true. I hope that Americans will find more time and do a thing or two about there lazybones problem. I just finished reading a good book about a gorilla named Ivan and an elephant named Ruby. Ivan,Ruby,and Stella another elephant all live in the Big Top Mall. Stella’s final words to Ivan are please save Ruby from the life I had. Ivan takes it upon himself to somehow free Ruby from the cage she lived in. Ivan is a skilled artist and hopes that Julia another artist will understand his message. Who knows, maybe along the way Bob the stray dog will find a home and Ivan will finally trust humans. Sadly Ivan thinks he is the only gorilla left in the world because everyone in his family was killed by humans. Will Ivan see another gorilla? Will Bob find a home? Will Ruby’s life be saved? It’s all in a matter of art that Ivan may have a slim chance at succeeding. The book The One and Only Ivan by Katherine Applegate has won the Newberry medal and is a great book. I think you should read it. Today a woman from Peace Dragons an company that teaches kids about peace came to my school. A cool thing she taught me about was that we are all humans and humans are imperfect. Then she asked what imperfect meant. It means I’m perfect. Get it? Im/perfect. Another thing she taught me how to do was make a hart shield. to make a heart shield you have to accept everything about ourselves even the imperfect stuff too. A heart shield can block every bad word someone said to you so it wouldn’t matter. Peace in means that you have peace inside yourself. Also remember peace will always find a way to come out. Peace talks.